It will take more than Hitler’s Luftwaffe to break the spirit of the residents of Lavender Road. If courage and resilience could win wars, the conflict would already be over. From stolen glasses in the Flag and Garter to fancy dinners in the heart of the West End, from a desperate battle for survival on a hospital ward to a torpedo hitting its target in the Mediterranean Sea, LONDON CALLING takes readers into a world of ordinary people living extraordinary lives. 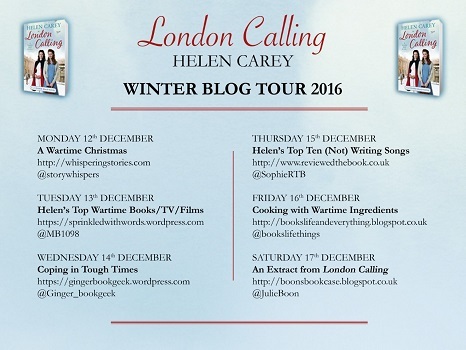 London Calling is the fourth book in the Lavender Road series of novels by Helen Carey. Unfortunately, I haven’t read the first three books, and although the characters are present in the other books, I never felt confused. This novel can definitely be read as a stand alone. We are whisked back to London in the early 1940’s, starting in 1942. World War Two is raging, and all the resident’s are dealing with the war in their own way. The book hosts some wonderful secondary character’s, whilst concentrating mainly on nurse Molly, aspiring actress Jen, and Jen’s frugal mother Joyce. I would have to say that my favourite characters were Molly and Jen. Nurse Molly works in the sepsis ward at Wilhelmina Hospital. She hates her job, and wants to get away from living a daily life of caring for patients she knows will die in the end from their wounds. Jen dreams of being a famous actress. She is immensely rude, and has one agenda in life, herself. The two women don’t exactly see eye to eye, as Jen tries to belittle Molly at every given opportunity. However the girls have to learn to get along, as their lives may just depend on it. 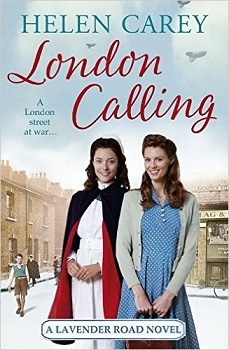 I’ve often struggled with historical fiction, but Helen Carey has written London Calling, with such passion and knowledge of the era, including vivid descriptions, that you feel that you, yourself has stepped foot into the past. The book is long, at 640 pages, but that didn’t stop me whizzing through it. There is something to grab your attention and keep you intrigued and emotionally transfixed on every page. In no time at all I suddenly arrived at the last page, and was sorry to have gotten there. Though it is thrilling to know that there is another book in the series due out next year. The book was a heart warming read. It will have you laughing, crying, holding your breath, but that’s what makes a great story. It will have you investing your time in the lives of the characters who are in Lavender road and beyond, as we travel to Italy, France and North Africa. Whether you are big on your historical fiction, or not, this book is an incredible tale of bravery, love and trust, and is a must read. Christmas is coming and don’t we know it! Every advert encourages us to make our Christmases as sumptuous as possible. And even as I trawl the shops for that special gift for the person who has everything, for dainty stocking fillers, and for the most tempting party snacks, I can’t help thinking how different it would have been in 1942, when my new novel, LONDON CALLING, is set. It was virtually impossible to get hold of fresh turkeys in London 1942. Nor, of course, were there any frozen ones. The best most people could manage for their festive lunch was a chicken and dumpling pie, and due to the strict rationing of suet, dried fruit and sugar, Christmas puddings were either very small or non existent. The toy shops were pretty much bare too, and children thought themselves lucky if they got more than an apple, a handkerchief and a piece of coal in their stockings. During some recent research I came across a leaflet called ‘Toys from Tin’ which told wartime fathers how to construct a push-along train from a sardine can (washed), a boot polish tin and some screws and washers. Another leaflet explained that a ‘wonderful’ farm could be made by creating cows from cotton reels, with wire for their heads and tails, leather scraps for ears. This year we have a three year old staying with us for Christmas and I have a feeling she might not be awfully impressed by a cotton reel cow! Instead of gifts (home-made or not), the British government encouraged people to give each other War Bond savings vouchers instead, and the Red Cross got people to ‘Adopt a Prisoner of War’ (rather in the same way as people ‘adopt’ endangered wild animals nowadays!) Crackers, paper-chains, paper hats and baubles were made out of painted newspaper, and if you fancied a tipple, the likelihood was that your local pub would have asked you to bring your own glass! All in all I think we can safely say that Christmases have changed! Whether it’s for the better or not is a matter of opinion. But either way, I hope you enjoy the festivities, and remember to raise a glass to all the stalwart souls (like the characters of LONDON CALLING!) whose grit and resilience made it all possible! Having spent time in various different parts of the world, Helen Carey now lives in Pembrokeshire, West Wales, in a beautiful location overlooking the Irish Sea. She has had a number of jobs and her varied experiences of working as a chalet girl, a waitress, a travel agent, an oil trader, a management consultant and in the British Army have all featured in one form or another in her books. She teaches Creative Writing at University level is a Fellow of the Royal Literary Fund. Her aim is to entertain, and her sense of character, story structure, pace and humour all combine to create compelling, page-turning novels which attract fans from all over the world. I’m so glad you enjoyed London Calling. Thanks so much for hosting my post on your lovely blog! Very much appreciated! You’re very welcome. Lovely to feature you on the blog.